Rafu publisher shares tips from his recent trip to Japan. A version of this story originally appeared in our holiday issue on Dec. 9, 2014. To purchase a copy of the issue, stop by our office or call us at 213-629-2231. I recently traveled to Japan with friends and family. We had a small, manageable group and, following advice from friends in Japan, we acted as our own travel agency. Eating our way from Tokyo south down to Miyajima, we experienced a side of Japan new to most of us. Here are a few of the interesting places where we stopped along the way. Sparks cover a tezutsu hanabi shooter. At a festival in Higashi-Izu, Shizuoka, a fireworks show was held on the bed of the Shirota River using tezutsu hanabi or hand-held fireworks. 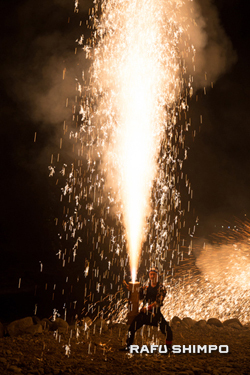 Sparks shoot 30 to 50 feet from the rope-wrapped, bamboo canisters and shower the specially-trained holders. Traditional tezutsu hanabi are used in festivals from eastern Aichi Prefecture through western Shizuoka, culminating in the Tachienbi Katasezuki festival, with its assortment of fireworks from all over the region. The original tezutsu hanabi are said to have been developed from the signal flare of the Sengoku period, approximately 550 years ago, in 16th-century Japan. Three years ago the festival moved from August to early October to coincide with the shining harvest or katase moon. In 1856, the United States consulate was established at Gyokusen-ji temple in Shizuoka Prefecture. The delegation was led by the first consul general to the Empire of Japan, Townsend Harris. According to folklore, the Japanese government did not want the consulate in Tokyo but instead offered the location in Shimoda, at the tip of the Izu Peninsula. Harris is credited with opening Japan to Western influence and remembered by Japanese diplomats as more than a friend. He is known for the Treaty of Amity and Commerce (Harris Treaty of 1858). In recognition for his efforts and dedication to both Japan and the United States, the temple and offices were designated as a National Historic Site in 1951. Step into the world of ramen when you enter the Shin Yokohama Raumen Museum. The top nine restaurants from around the world serve their ramen here: Ryu-shantai Honten and Sumire (miso); Mon-no-bo Toride and Kumurasaki (tonkotsu); Nidai-me Genkotsu-ya and Shinasoba-ya (salt/shoyu); Kamome-shokudo (salt); Muku Zweite (tonkotsu syoyu) from Germany; and Narumi-Ippodo (consommé) from France. When we stepped onto the two-floor restaurant arena, we were transported back to the time instant ramen was invented. To commemorate the invention of instant ramen, Tokyo, circa 1958, is recreated with old storefronts, alleyways and movie billboards, complete with clouds covering the ceilings and walls. Located in front of each restaurant is a ticket vending machine. Select your order, number of bowls, type of ramen and portion size. Once inside, servers will accept your ticket and bring your meal. If you plan to try more than one of the restaurants, pick the small portion. The Museum Shop is located on the third floor. There were utensils specific to ramen are mixed in with chopsticks, bowls and little treats with assorted types of ramen with different broths and noodles from all over Japan. We decided not to create an original “My Ramen” dish but instead purchased assorted ramen to bring home. Don’t forget to have someone translate the cooking instructions for you. 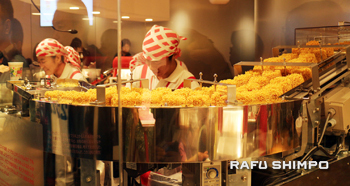 Instant ramen noodle cakes come out of the oven at MyCupNoodles Factory in Yokohama. Separate from the Raumen Museum is the CupNoodles Museum, also in Yokohama. CupNoodles was invented in 1971 by Momofuku Ando, creator of instant chicken ramen. A story about the Momofuku Ando Instant Ramen Museum in Ikeda City appeared in The Rafu in 2013. 1. Decorate your personal styrofoam cup with drawings, doodles and writing. Can I use a crayon? 2. Get in line, hand your cup to an attendant. Your “cake” of dry ramen is placed into the cup. 3. Select your broth flavor (chicken, beef, curry, and more). 4. Select four toppings from 12 selections, including eggplant, shrimp, corn, kamaboko and mushroom. Four selections are not enough. 6. Take home, add hot water and enjoy before the stale date. Ohtorii gate of Itsukushima Shrine in front of Miyajima Island. 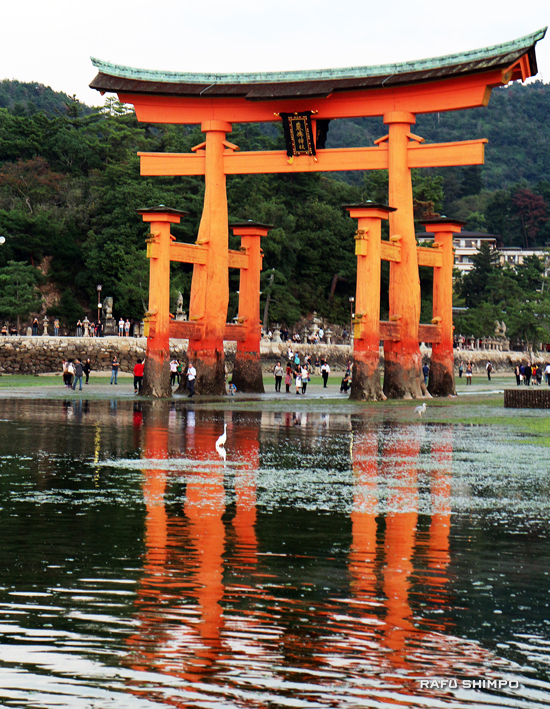 The island of Miyajima is a destination for tourists, both Japanese and foreign. The setting of temples, shrines and breathtaking vistas is both primeval and tranquil, and gives a glimpse into Japan’s identity. Traveling up to Mt. Misen in a sky gondola. According to VisitHiroshima.net, the No. 1 reason to visit Miyajima Island: “It is the island where God dwells.” The Five-Tiered Pagoda and Mt. Misen make this statement feel possible. Mt. 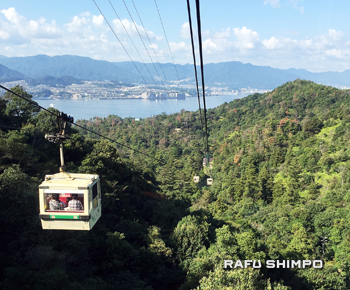 Misen is the highest point in Miyajima. It can be reached by a combination of air gondola and hiking. The hike over the peak will take you through six of the seven Wonders of Misen. The iconic image of the island, the Ohtorii gate of the Itsukushima Shrine, greets the ferry crossing a narrow portion of the Inland Sea. After we landed, we strolled through the town, saw wandering wild deer and found a popular restaurant to try dishes native to water farms, like kaki fry (fried oysters) and anago (conger eel). Our experience included a stay at Awaso, a Japanese-style ryokan hotel. We stayed in a traditional room, meaning shoes were left at the door. Amenities were an onsen (hot springs bathing), an omakase (chef’s choice) dinner and Japanese-style breakfast, complete with grilled fish and miso soup. Robot Restaurant is located in Shinjuku, Tokyo. You will need reservations if you wish to enjoy the restaurant or the energetic show. Entertainment includes taiko drummers on moving stages, dancers performing in robot outfits, giant robots, dancers performing on giant amazon figures, robot wars (boxing match) and a good-versus-evil act.